We would like to thank everyone who joined us for our NoTouch Webinar on August 8, 2018. Those in attendance were able to get an in-depth look at how IT professionals use NoTouch Center for smart endpoint management. For anyone who was unable to make it to the webinar themselves and need a recap, we’ve created this summary just for you! 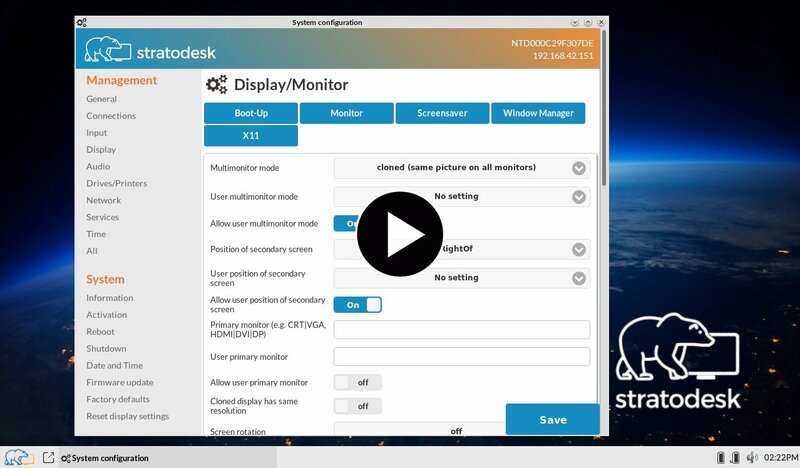 By way of introduction, Stratodesk’s NoTouch Desktop is comprised of NoTouch Center and NoTouch OS, and is the leading endpoint OS and management solution. It is used by government and healthcare organizations, banks, SMBs and large enterprises to eliminate cost and scalability obstacles facing their complex network of devices. By delivering the only management software for mixed environments of x86, ARM and Raspberry Pi devices, Stratodesk is reinventing endpoint computing for enterprise IoT and VDI. Our cutting edge, linux-based solution, NoTouch, is hardware-agnostic and runs on the Raspberry Pi. Discovering endpoints with NoTouch Desktop is easy and can be done automatically. When an endpoint is discovered, it is added to an unassigned group by default. You can discover your endpoints by going to tools and providing the IP address or an IP address range. NoTouch Center finds all of the endpoints in that range and adds them to an unassigned group. Once endpoints are discovered, configurations can be done on a group level to enable inheritance of settings, or on a device level. Once you have configured a group to be how you want, you can then send the changes you have made down to your endpoints via announce. Create a connection and name it, for example, after the environment that you are using. You can then set parameters and create multiple connections for various different environments and browsers. You can also connect services like Imprivata. Simply turn on the service and give it a host name. Configure a connection that you would like to launch. Any of the connections that you have created can be launched as soon as you swipe your badge using Imprivata. Configure Raspberry Pi devices, like the Citrix Ready Workspace Hub, as well. When using NoTouch Center, you can incorporate most x86 or ARM based devices. Operations and maintenance can be done under the “Resources” tab. Client images and update files can be uploaded here, as well as Certificates. NoTouch also fully supports SCEP for enterprises. Lastly, under the “Resources” tab, it is simple to upload wallpapers that will be displayed on your endpoints. Additionally, several more advanced parameters and configurations exist within NoTouch Center. Specifically for Citrix or VMWare connections, you can go to that connection and see that connection specific tab. Once you do this, you will see a variety of different parameters that can be configured for that connection. For Citrix, we we have introduced smart card logins as an optional parameter. Now available with many authentication providers. Other parameters include Speechmike support, multimedia support (including H.264 and Skype for business), Cisco Jabber Devices. The VMWare connection tab has similar parameters available but you can also select specifically which protocol you wish to use. What would it take to update images –how easy is it to push updates out to endpoints? Under resources, set your client OS image and update mode. A lot of customers have end users based in different sites. There are a lot of concerns over bandwidth usage and extreme bandwidth usage when sending images out over a WAN. In this situation, we recommend having a web server on each site where you can host the update file. This makes updating very easy and keeps traffic on a LAN instead of a WAN. Can you manage devices at multiple worksites from one central location? Customers can deploy our Virtual Appliance at each of their remote locations for imaging/PXE purposes. Turn the NoTouch Center process off on each of those VAs. This allows you to have multiple virtual appliances in multiple locations, and one master Virtual Appliance running the NoTouch Center process. Configuring it as an image pool will distribute the OS image that you upload on your master VA. This upload that you do on your master VA gets updated or synced with each VA that you have at your remote locations. So you only have to manage one VA while all the others are replicated and synced. What install options exist for NoTouch OS? You can access NoTouch on a USB Drive and/or CD-ROM, Run NoTouch in Live Boot Mode for BYOD deployments or install permanently. We also have two enterprise rollout methods available for installing onto thousands of endpoints or even tens of thousands of endpoints: PXE boot server and MSI Installer. Stratodesk’s Virtual Appliance includes a PXE boot server preinstalled which makes it easy to install to thousands of devices in minutes. It can also act as a network boot server and always have the ability to boot from network. The MSI package is great if you have a large collection of Windows powered devices and you want to convert those devices to NoTouch Desktop. You can use the MSI package to get our image onto all of your devices, automatically deleting Windows, reformatting the hard drive, and installing NoTouch onto those endpoints. With NoTouch, you can also use the auto discovery/configuration methods to automatically assign endpoints to preconfigured groups. To do this, we recommend using the hostname of TCMGR for your Virtual Appliance. Every NoTouch OS device is configured to look for the host name TCMGR on the network when it boots up for the first time. This can be configured as a DNS alias on the DNS server, so it doesn’t actually need to be the hostname of your Virtual Appliance. Doing this enables automatic discovery –every time your endpoint is booted for the first time it will be discovered by the Virtual Appliance, it will look for the TCMGR host name. Once it is discovered, you can do a group level auto assignment that can be done as well. There are a lot of parameters you can use for auto assignment including IP address patterns. As soon as a device comes up, it is going to search and find the TCMGR host name, and because it matches the IP address pattern, it will be put into the MyClients group, and all of your configurations will be sent down to the client device. This way the whole discovery and configuration process becomes automated when you have TCMGR set up and auto configuration on the group level set up. With automation, customers who are rolling out a thousand or thousands of devices at once can get up and running much more quickly. How does the information go from NoTouch Center to the endpoint? Mainly we use a WebSockets connection that is created over HTTPS or HTTP to trigger the announce process from the OS. When we trigger an announce from NoTouch Center, for example by going to the actions tab, NoTouch Center requests the endpoint to start the announce. So even in this case the announce originates on the client OS. Can NoTouch Center be run on premises or in the cloud? We have both options available. We will host NoTouch Center for you and are responsible for keeping it up to date. We provide you with a public IP address for NoTouch Center which is quite useful for users who are home based or who are not on the same network as a corporate network. By having a public IP address, they have access to the server protected by SSL HTTPS so there are no security issues while using it. For on premises, the virtual appliance can be deployed on a hypervisor like ESXI, XENSERVER, or Microsoft Hyper-V if you want to keep it on premises. What if I am an enterprise global corporation and I have locations in places around the world. Will there be any problems or lags when running NoTouch Center in the Cloud? Because we use cloud services like AWS and Azure, we can have NoTouch Center physically hosted in any country where your offices are located, thereby eliminating any lag, security or legal concerns. How does the support file feature work? Support file is essential in trouble shooting. The support file itself is a collection of log files from the endpoint or a support file from the Virtual Appliance, and various commands that we run as well as the syslog. This can be downloaded and sent to us at [email protected]. It’s pretty simple to retrieve support files –every endpoint that you have has a web server running on it as well as a web interface. If I put the IP address of my endpoint, I can reach the web interface where I can download the support file. Or, use a USB stick that you connect directly to the endpoint, and then on the endpoint you can go to the configuration menu, select support file, and that file will be put directly onto the USB stick. You can then upload that file to our upload support file page along with your support ticket number. This provides an in-depth view to log files and gives the support team so much information and is integral to supporting you and coming to a resolution to your issue quickly. What exactly is the Workspace Hub? It is a three way partnership. That partnership is between two OEM partners that provide the Raspberry Pi devices, NComputing and ViewSonic. Stratodesk creates the operating system that runs on those devices. And of course, the Citrix magic in their software suite that makes the Workspace Happen. The only way to get the Workspace Hub functionality is through NComputing and ViewSonic. That’s how Workspace Hub works and how we partner with Citrix and our hardware OEM partners. Workspace Hub devices are already licensed by default. When using x86 device licenses, you purchase a bundle or a pool of licenses. After purchasing licenses, you would upload those licenses into NoTouch Center. As soon as you start adding clients, the licenses will start being distributed to those clients. The number of available licenses will go down and the others will start going up. If you delete licensed devices from NoTouch Center, you will get your license back. So you can reuse licenses on different devices.